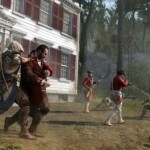 Assassin’s Creed 3 is the fifth installment of the Assassin’s Creed series. It is the conclusion to the story of Desmond Miles, an Assassin who looks to save the future by the searching through the past, as he relives the memories of Connor, an Assassin from Colonial America. 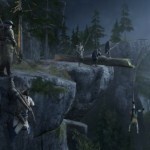 Version Reviewed: PCThe plot of Assassin’s Creed III started extremely slowly to me. I mean, Desmond goes plop! – back into the Animus, but it’s only after two hours of gameplay that you actually get to play as the MAIN character in this game, Connor. Connor, a half-Mohawk half-British kid, leaves his village to join the Assassins, then eventually the Patriots, in the Revolutionary War, because a magic cricket ball tells him to. He then spends his time fighting for whichever of the three factions he is most loyal to, depending on what the plot requires. 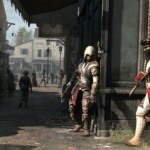 Even after he’s killed his final Templar, Connor’s story gets no closure. Desmond, the protagonist of the entire series, instead gets his story concluded abruptly and without a satisfying ending.Control-wise, Assassin’s Creed III plays fairly well. The combat system, despite taking me a few hours to get the hang of, basically consists of waiting for enemies to attack and then countering and killing them. It works decently, unless you’re surrounded by ten grenadiers who immediately block any counters. In terms of free-running it’s alright, but hindered by the fact that running and climbing are mapped to the same button. This causes problems when you’re chasing a Templar through the alleys of New York and Connor starts randomly climbing the side of a building. It’s annoying, but you get used to it eventually.This game adds in A LOT of extra features, most of which hardly seem necessary. I mean, in my first playthrough, I didn’t even know about the Homestead missions, Almanacs, or Naval Missions. Lockpicking was a bother for me, as it took me an hour just to work out how to do it and another hour to open the first chest. That’s not to mention that you only need lockpicking for two missions in the main quest, so I didn’t really see a point. On top of all this, there are also collectables and side missions. The game tried to cover all its bases in terms of extras, but ended up spreading itself too thin. 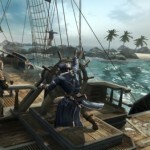 The visuals of the game are great- particularly the character animations – but because of that quality, the game is susceptible to several bugs and glitches. The issues range from getting stuck on a bench or grabbing thin air instead of a guard to a blurry screen throughout a whole mission. While these weren’t really things that ruined the game, they’re still things I wish would’ve been better. All in all, the game IS good. It starts off too slow and gets the good in the middle, but then goes downhill at the end. It’s certainly not the grandest finale to the series, but at its core is still fun.